Borderlands; North America; History; 19th century. Indians of North America; Languages. Anthropological linguistics; North America; History; 19th centeury. 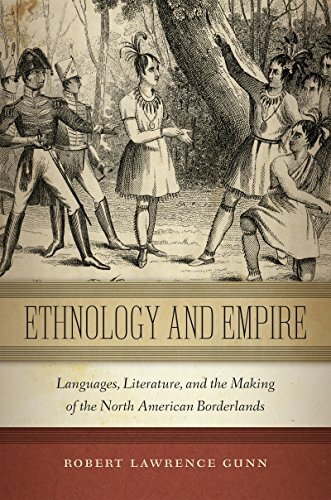 Ethnology and Empire tells stories about words and ideas, and ideas about words that developed in concert with shifting conceptions about Native peoples and western spaces in the nineteenth-century United States. Contextualizing the emergence of Native American linguistics as both a professionalized research discipline and as popular literary concern of American culture prior to the U.S.-Mexico War, Robert Lawrence Gunn reveals the manner in which relays between the developing research practices of ethnology, works of fiction, autobiography, travel narratives, Native oratory, and sign languages gave imaginative shape to imperial activity in the western borderlands. In literary and performative settings that range from the U.S./Mexico borderlands to the Great Lakes region of TecumsehÃ¢ÂÂs Pan-Indian Confederacy and the hallowed halls of learned societies in New York and Philadelphia, Ethnology and Empire models an interdisciplinary approach to networks of peoples, spaces, and communication practices that transformed the boundaries of U.S. empire through a transnational and scientific archive. Emphasizing the culturally transformative impacts western expansionism and Indian Removal, Ethnology and Empire reimagines U.S. literary and cultural production for future conceptions of hemispheric American literatures. About: Winner, The Early American Literature Book PrizeEthnology and Empire tells stories about words and ideas, and ideas about words that developed in concert with shifting conceptions about Native peoples and western spaces in the nineteenth-century United States. About: Ethnology and Empire tells stories about words and ideas, and ideas about words that developed in concert with shifting conceptions about Native peoples and western spaces in the nineteenth-century United States.